Paul Di Resta is determined to remain in Formula 1 despite ending the season 12th in the drivers' standings. Force India finished the constructors' table in sixth place, casting doubts over the Scot's future in the sport. "Who knows what the future holds? But I'll be trying my damned hardest to stay in Formula 1," said Di Resta. "I've still got fire in my belly. I'll still be racing competitively. Formula One has been a great experience and I hope it stays that way." The Scot finished 11th in Sunday's season-ending Brazilian Grand Prix, which was won at Interlagos by Red Bull's Sebastian Vettel to complete a record ninth consecutive success. The Press Association has reported that it appears likely that Sergio Perez, the Mexican who has been axed by McLaren, will partner Nico Hulkenberg as the Force India drivers next season. Hulkenburg has reportedly been re-hired by the Silverstone-based team after the German quit them a year ago to join Sauber. 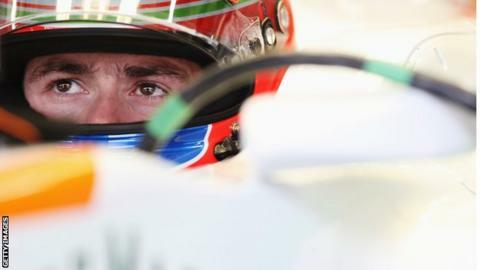 It suggests that present Force India drivers Paul Di Resta and Adrian Sutil could face an uncertain future in the sport. While Perez produced a superb drive to finish sixth after starting from 19th in Brazil, Di Resta was left to reflect on a poor finish to his third season in Formula 1. He is hopeful of staying on for a fourth but he acknowledged, with competition fierce among drivers, his future with Force India was uncertain. "Yes, there were a couple of races where we had a blip, but it was definitely strong," said Di Resta. "We've achieved our constructors' position. I missed top 10 on the driver's standing by one point, but at the end of the day, that's the way it is. "We can be very happy with what we've achieved. It's about trying to see what's right for the future and trying to take the right journey. "There's bigger things that stop us staying in the sport in the midfield. You have to accept it. "People are saying it's not budget-related, but there is things in there that say that, but, I'll go with my head held high for the winter."